I need to use my slow cooker more often. It’s one of the best ways to turn inexpensive ingredients into a knockout dinner. Take this lamb vindaloo, for example. All you need are a few veggies, spices, and an inexpensive cut of meat and, just like that, you are an incredible chef. I also love that cooking times in the slow cooker are not very strict. When something can cook for 6-8 hours, you don’t have to time things exactly. Just serve it when you’re hungry. I made this vindaloo last Sunday and invited a friend over to share it with me before we headed to a concert. She arrived to my house fashionably late, but there was no worry about dinner having gotten cold. I used a recipe from the website Critical MAS. He made his with pork but suggested that lamb would be a good alternative. I agreed. I thought the spices were perfect and the lamb and potatoes were incredibly tender. I served it with some basmati rice that I fancied up with some butter, turmeric, and mustard seeds. Bonus: the whole meal was just as good reheated the next day. Place chopped potatoes in the bottom of the slow cooker. Lay the onion, lamb, garlic, and ginger on top. In a separate bowl, combine spices. Use a blender or food processor to pulverize tomatoes and mix into the spices to form a paste. Add to the slow cooker and stir. Add red wine vinegar and broth. Turn slow cooker onto high for an hour and then drop to low for an additional 4-5 hours. Serve with basmati rice. * I added this recipe to this week’s, Mix it Up Monday, Melt in Your Mouth Monday, Fat Tuesday, Fight Back Friday and Fresh Bites Friday. 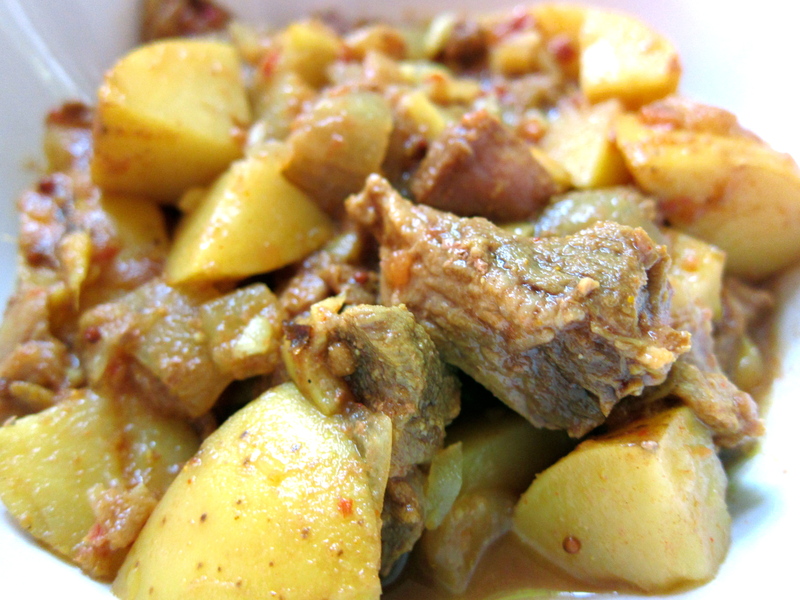 This entry was posted in Uncategorized and tagged indian food, lamb, recipes, Slow cooker, Soups and Stews by hännah. Bookmark the permalink. Excellent job. Glad the dish turned out great. I’ve made it now twice with pork and twice with lamb. Not sure which one I favor. I just noticed an error. Step1 should be place chopped “potatoes” on the top. The tomatoes come later. Oops , I meant “on the bottom”. Haha, Michael, I think you manage to find every typo I ever make! I appreciate it, though! I noticed the potato/tomato mix up, too! 🙂 I have this recipe in the crockpot right now, but with salmon. Can’t wait to see how it turns out. Thanks for posting.